[ZPriddy] was looking for a way to control his Nest thermostats with Amazon Echo. He didn’t want to settle for using AWS or some other hosted service. [ZPriddy] wanted something that he could host and manage completely on his own. The end result is what he calls EchoNestPy. [ZPriddy] started by learning how to use the Alexa Skills Kit (ASK). ASK is the official SDK that allows enthusiasts to add functionality to their Amazon Echo. Unfortunately for [ZPriddy], most of the example code he found was designed to be used on Amazon Lambda, but that didn’t stop him. After finding a few examples of Amazon Echo requests and responses, he was on his way. Click past the break for the rest of [Daniel’s] story. [Styropyro] did a great job of taking common parts and making an interesting item. 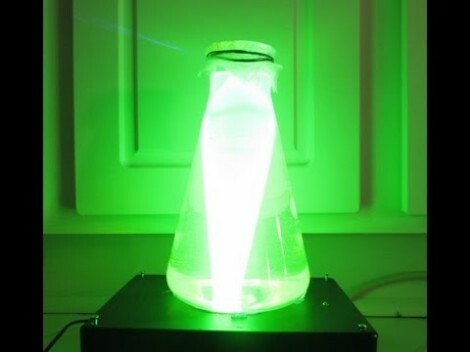 He calls this his Tornado lamp, and it’s made with stuff you probably have around the house — well you might have to substitute more common glassware for that Erlenmeyer flask. The bulk of the hack is in the base. You’ll find a laser diode pointed at a small scrap of mirror. That mirror is mounted on the center of a small case fan, giving the tornadic effect when spinning. To make everything fit just right, the laser is pointed horizontally, with the fan/mirror at a 45 degree angle. The beam points up through a hole in the project box and illuminates the liquid in the flask. That liquid is water doped with a substance that fluoresces. In this shot it’s some fluorescein, but we did mention you can do this with stuff from around the house. [Styropyro] demonstrates the use of liqud from some highlighting markers as a substitute. If you’re decoration a mad scientist’s lab this is a perfect companion for a Jacob’s ladder.